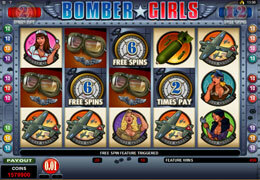 Bomber Girls is a non-progressive slot with Bomber Girls used by WWII American soldiers for pin ups. Icons depicted in this exciting game are nurse uniforms, mechanics, radio controller, airplanes, goggles, compass, playing cards and empty bomb cases. 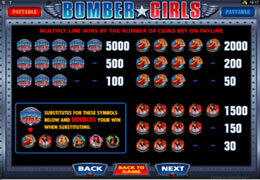 The Bomber Girl is the Wild and substitutes all other icons and helps form winning combinations. The Compass and the Table Top icons is the Scatter and help to increase winnings. If 3 Compass icons show up on reels 2, 3 and 4 players will win three times their total bet. There is also a chance to win 14 Free Spins. The Table Top icon is used to activate the High-Low Bonus when it shows up on reels 1 and 5 and bets will be doubled.